In collaboration with Utah Campus Compact, Dixie State University granted five Presidential Community Engagement Awards to recipients including the City of St. George in a ceremony Friday morning. The Presidential Community Engagement Awards recognize individual and community partners’ commitment to service-learning, community engagement and campus-community partnerships. 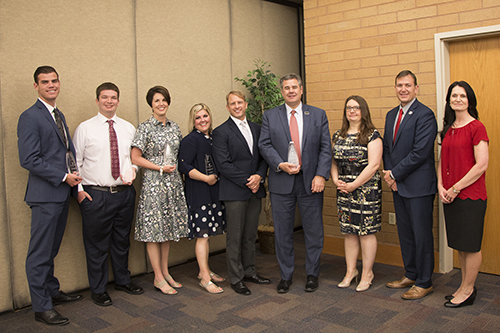 Dixie State and Utah Campus Compact, a statewide coalition of colleges and universities that increases higher education’s capacity to serve the public good, presented the awards as a way to promote civic responsibility, service, collaboration, inclusiveness and flexibility. The Community Engaged Partner Award was presented to the City of St. George, with Mayor Jon Pike and Marc Mortensen, support services manager, accepting the honor. Pike and Mortensen were recognized for strengthening the relationship between the city and the university, helping create a university town atmosphere and creating new opportunities for community members and students alike. The distinction of Community Engaged Student went to Dixie State University Student Association Vice President of Service Dillon McKinney. As a member of the executive board of student government, McKinney leads a team of five service leaders, and together they manage the relationship between Dixie State and 14 nonprofit community partners. During the 2015-16 academic year, McKinney and the service branch provided 44 service events and led the campus in contributing more than 5,000 service hours to causes such as national hunger and homelessness. Making a difference in the lives of the community’s future leaders, Wendi Bulkley was presented with the Community Engaged Alumnus Award. The vice president of public relations for the DSU Alumni Association, Bulkley is also serving as the interim advisor for Dixie Sate’s Student Alumni Association. Teaching the association’s weekly leadership class, Bulkley has put together new curriculum and arranges for guest speakers to present, so students can meet community leaders while building leadership skills and networking abilities. Assistant Professor of Dental Hygiene Brenda Armstrong received the Community Engaged Faculty Member Award. Armstrong and the students in her Community Public Health Administration course teach about oral health to area elementary-aged children, perform oral cancer screenings at Huntsman Senior Games, teach Certified Nursing Assistant students the importance of oral care for the elderly and advocate for access to care by visiting the Utah State Legislature. Additionally, Armstrong and her students helped with the Give Kids a Smile event to provide $30,000 in dental care and $32,000 in vouchers for follow-up treatment to children in need. Henrie Walton, community, state & federal relations officer for Dixie State, was named the Community Engaged Staff Member for his work in the area of politics and public policy. Walton was instrumental in establishing the university’s Institute of Politics and Public Affairs. In the institute’s first year, it hosted election debates, offered federal and state government internships, registered more than 400 students to vote, and sponsored political forums with elected officials such as Gov. Gary Herbert, Utah Speaker of the House Greg Hughes, U.S. Rep. Chris Stewart and former state senator Pat Jones. Walton also worked with Dr. Nancy Hauck, associate provost of community and global engagement, to draft the Civic Action Plan for Dixie State University, which aims to increase civic engagement, cultural vibrancy and economic growth in Washington County. Closing the ceremony, Alexis Bucknam, Utah Campus Compact executive director, thanked the recipients for their contributions to community engagement. For more information about Dixie State University, visit www.dixie.edu or to learn more about Utah Campus Compact, visit www.utahcompact.org.